Let the raw vitality of the Legends collection by John Hardy transform your style. This collection draws its inspiration from animals of power, each representing its own character through design. 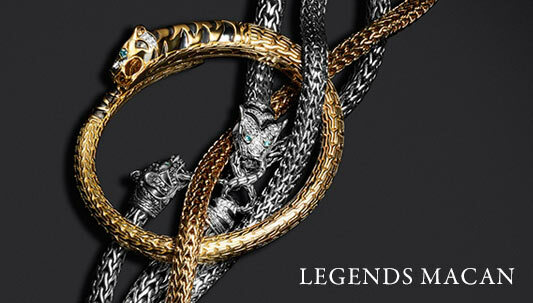 The Legends Naga collection holds the Naga dragon in the highest esteem. These mythical talismans are fabricated in bronze, sterling silver, and 18kt yellow gold and showcase the head of a Naga dragon or dragon scale motifs. They are boldly embellished with African rubies, sparkling diamonds, and scintillating black sapphires to add flair to each piece. Known for a fierce spirit, the Macan tiger is the star of the Legends Macan collection. Bold stripes of blackened sterling silver, white diamonds, or black sapphires form the tiger’s head that is represented in several jewelry pieces, and his piercing eyes of Swiss blue topaz will stare right through you. You will embody courage and strength wearing pieces from this collection. The Legends Cobra collection is all about transformation and renewal. Swirls of London blue topaz, blue topaz, and white sapphires against hand-carved sterling silver imitate the cobra’s patterned skin, or you can choose a more sophisticated look with black chalcedony and black sapphires that are mixed with white sapphires. Lastly, the Legends Eagle collection signifies freedom and independence. Eagle heads and feathers are beautified with smoky quartz and sapphires to created a feathered effect. Welcome to John Hardy’s luxurious jungle!